Independent Newsmedia, Inc., USA, publisher of the Daily News-Sun and ten community newspapers throughout the Valley, has been awarded one of two Pakis Center for Business Philanthropy grants in recognition of the company’s innovative approach to corporate philanthropic initiatives. The grant, announced in October, was the result of a competition conducted by the Arizona Community Foundation. The Boost! Corporate Philanthropy Prize is a competition that recognizes innovative philanthropy initiatives in mid-sized, Arizona-based companies. Willmeng Construction was the second company selected for the prize. Both firms each received a $40,000 grant to use to bolster their local philanthropic efforts. The Independent intends to use the funds to launch several new initiatives in 2019 to enhance its efforts to assist and partner with local nonprofit organizations. Independent Newsmedia has published award-winning community newspapers in the Phoenix market since 1977. In addition to publishing local newspapers, the company has created citizen-driven community websites and also operates a commercial printing plant. The company presently publishes the Daily News-Sun, as well as five community weekly publications, five monthly publications, a monthly magazine and several community news websites, including www.yourvalley.net. The company also owns Valley Newspapers, a state-of-the-art commercial printing plant. The Pakis Foundation lauded the company’s efforts to support and promote charitable organizations throughout the Valley. The company has created a process that encourages nonprofit organizations to formally request assistance in the form of editorial coverage, in-kind contributions, event sponsorship, volunteer support and more. A Charity Begins at Home Committee comprised of seven employees will monitor and respond to requests with suggestions as to how the company can be of assistance. The committee will also use the company’s network of business associates and advertisers in an effort to match potential sponsors and partners with local charitable organizations seeking support. The committee will also track all contributions made in 2019 by the company to its “Charity Begins at Home” campaign and provide an annual report on its efforts and progress to the community at the end of the year. The committee will also be responsible for recognizing volunteer service performed by company employees. Beginning in 2019, the company will establish a quarterly rewards program recognizing those employees who personally give back to their communities. 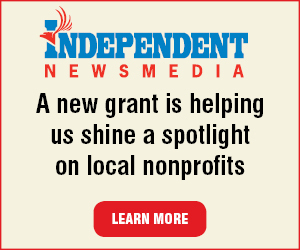 The Independent will also provide discounted advertising rates to nonprofit organizations. To apply for assistance, download a Charity Begins at Home Application. To request assistance or to share upcoming charitable endeavors, email charity@newszap.com. Independent Newsmedia supports every American’s First Amendment rights and assists citizens in exercising those rights responsibly. The pursue this mission by publishing purposeful newspapers, providing printing services to other publishers and creating citizen-driven websites. The company is owned by a nonprofit trust and designed to maintain independence. The organization has no shareholders, no dividends are paid and all after-tax profits are reinvested in serving its mission. The Arizona Community Foundation’s Pakis Center for Business Philanthropy aims to inspire businesses to develop innovative philanthropy initiatives. Mid-sized, Arizona-based companies compete for the $40,000 BOOST! Prize to enhance their efforts as good corporate citizens. Two Arizona companies are chosen each year to receive the prize in recognition of their innovative philanthropy initiatives. Look for information about the BOOST! Prize and the application process at azfoundation.org/BOOSTprize.